Are My Roots Showing? 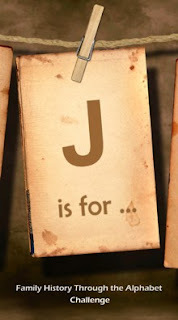 : J is for ... JEWEL! We find jewels in the most unexpected places, especially when we aren't even looking for them. My 2nd great grandparents, Zenophile and Eliza Lanctot, were proprietors of the first hotel in Armour, South Dakota from around 1900 until about 1913. It was called Armour House. When Zenophile died in 1913, Eliza ran the hotel by herself for the next three years, until she sold it. This couple has always intrigued me, mainly because Zenophile is one of my "gateway" ancestors (immigrated to the U.S.), and because in those days it wasn't very common for a woman to be calling the shots from a business standpoint. I've known this information for quite a while, but I've never been able to find a photo of Armour House. Apparently, it's because I was looking in all the wrong places. Thanks to the suggestion of my geneabuddy Laura, and some brainstorming on my part, I discovered the Douglas County Historical Society in Armour, South Dakota. I honestly didn't even know there WAS an historical society. I mean, the town only has a population of about 700 people. Her husband even went above and beyond, heading over to the cemetery to take a photograph of the couple's grave marker for me! Hindsight being what it is, I'm pretty sure my reply email sounded like a 14-year-old girl who was just given free tickets to a Justin Bieber concert, but whatever. Mr. and Mrs. Wiese are JEWELS. Not only did they respond to my request faster than lightning, they went above and beyond the call of duty, AND they are sending me the photos at no charge. They simply asked that I make a donation to the society. Well, of course I will! I have been truly fortunate to have crossed paths with these two wonderful people. I am definitely putting the museum (yes, they even have a museum!) on my list of places to visit when I finally make the trip to South Dakota. Greetings! Wondering if you have established an email contact with anyone connected with the Douglas County, Armour, SD, Historical Society. I also have a family connection dating back to the early 1900's. I have made a number of attempts to contact them, both via the Internet and USPS mail, which have gone unanswered. Ed, thanks for your comment! I sent you a private email that I hope will help you and Mrs. Wiese make a connection.